Draft: 2014, Seattle Mariners, 4th rd. Ryan's alma mater, Old Dominion, lines its outfield wall with photos of major leaguers that have come through the program…Ryan and Rays bench coach Matt Quatraro were both invited back for a banquet in honor of being added to the wall in January...Ryan proposed to his girlfriend, Nicole, at the end of April 2018…he told her they were going to get massages at the Don Cesar in Tampa on the team's first off day and popped the question on the beach…he had team photographer Will Vragovic near the spot to capture the moment… the two are planning a November wedding...Ryan was a groomsman in Jake Faria's wedding last winter…he was a big fan of the In-N-Out truck the couple provided for guests...He previously played with Emilio Pagán for several years in the Mariners system, calling him a great pitcher and teammate...Ryan and Nicole adopted a chocolate lab puppy named Cooper over the offseason…the first week proved to be a ton of work, but Cooper has since made great progress...He worked out in Tampa this offseason with Tyler Glasnow, Ryne Stanek and Kevin Kiermaier...Ryan grew up a Rays fan and kept some 2008 World Series gear in his bedroom of his Lakeland home, which he found after he was acquired in a four-player trade from the Mariners…he admired David Price, James Shields and Scott Kazmir as a youngster, and still has a Kazmir jersey he received as a 15-year-old hanging in his closet. Made 38 apps (6 starts) for the Rays, his first career major league action…received one thirdplace vote to tie for fifth in the AL Rookie of the Year balloting...His 16 wins were 2nd on the team behind Blake Snell (21) and led major league rookies, ahead of CLE Shane Bieber (11)…set a club rookie record, passing Rolando Arrojo (14) in 1998, and tied for 5th-most in club history…it was the most by an AL rookie since LAA Matt Shoemaker (16) in 2014 and most by a rookie lefty since ARI Wade Miley (16) in 2012...His 14 wins in relief were the most by any reliever since TOR Mark Eichhorn (14) and NYM Roger McDowell (14) in 1986 and the most by a lefty reliever since DET John Hiller (17) in 1974…was one shy of matching NYG Hoyt Wilhlem (15) in 1952 for the major league record for a rookie reliever...Led AL rookies with 147.1 IP and 128 SO…was the third Rays pitcher to lead AL rookies in wins, joining Wade Davis in 2010 and Rolando Arrojo in 1998…was the fifth Ray to lead AL rookies in innings and fifth to do so in strikeouts...Went 14-4 with a 3.72 ERA (118.2-IP, 49-ER) in 32 apps out of the bullpen and 2-2 with a 4.71 ERA (28.2-IP, 15-ER) in 6 starts...His 118.2 IP out of the bullpen were the most for any reliever since TOR Duane Ward (127.2 IP) in 1990 and the most for a rookie reliever since TOR Mark Eichhorn (157 IP) 1986…broke the club record previously held by Rick White (105.2 IP) in 1999…made 23 relief apps of at least 3 IP, most for a pitcher since Eichhorn (26) in 1986…his 18 relief apps of at least 4 IP were the most since BOS Bob Stanley (18) in 1982, and his 11 relief apps of at least 5 IP were the most since Stanley (11) in 1982...Yielded a team-high 18 HR, including 15 HR out of the bullpen, most among major league relievers and a club record among relievers...Three of his 16 wins came against the Yankees, joining Chris Archer in 2013 as the only rookies in franchise history to do that...Spent nearly the entire season on the active roster…was optioned to Triple-A Durham on April 29 but recalled on May 1 due to an injury to teammate Yonny Chirinos…did not appear in a game for Durham...On March 31 vs. BOS, made his major league debut in relief and his 73 pitches were the 2ndmost in club history for a reliever in his first career game, behind David Price (87) on Sep 14, 2008 at NYY…they were the most thrown by a Rays reliever at any point since Chris Archer (79) on Sep 13, 2012 at BAL, a 14-inning loss…his app of 4 IP tied for the 2nd-longest in club history for a reliever in his major league debut behind Price (5.1 IP)...On April 28 at BOS, recorded his first career win, replacing Yonny Chirinos with the bases loaded and no outs in the 3rd inning without allowing a run to score…yielded an RBI single to Hanley Ramírez in the 4th and solo homer to Rafael Devers in the 5th, but left with a 7-5 lead...On May 4 vs. TOR, entered to begin the 3rd inning and allowed a single to Dalton Pompey leading off the frame, but after that retired his last 15 BF…became the second reliever in club history to go at least 5 IP and allow 1 hit or fewer, joining Esteban Yan on April 13, 1998 vs. MIN...From May 19-25, became the first pitcher to go at least 6 IP in back-to-back relief apps, without a start in between, since BOS John Wasdin in 1999…from May 25-31, became the first pitcher to record 8 SO (or more) in consecutive relief apps since TEX Len Barker from Sep 17-25, 1977...On May 25 vs. BAL, went 7 IP out of the bullpen to tie for the longest outing for a reliever in club history…was the longest outing for an AL reliever since CLE Justin Masterson on Sep 12, 2010 vs. MIN…his 105 pitches tied Jason Hammel on June 13, 2007 vs. SD for the most in club history by a reliever...On May 31 at OAK, his 9 SO were a club record for a reliever…they were the most for an AL lefty reliever since MIN Johan Santana (9) on Sep 2, 2002 at SEA...On June 28 vs. HOU, his only run allowed in 6.1 IP was a solo homer to No. 9 hitter Jake Marisnick in the 5th inning…was the 13th time in franchise history the Rays lost 1-0 on a solo homer and the first time on a solo homer by the No. 9 hitter. 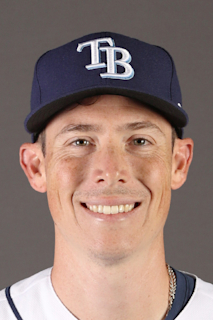 Spent his first season in the Rays organization with Triple-A Durham after being acquired from the Mariners in a trade involving Drew Smyly… his 13 wins, 26 starts, 157.1 IP and 159 SO were all career highs... Ranked 2nd among Rays minor leaguers in strikeouts, behind Brent Honeywell (172)…tied for 2nd in wins, one shy of José Mujica (14)… ranked 3rd in innings and 8th with a 3.43 ERA... Increased his strikeout total from 99 SO (6.94 SO/9 IP) with Double-A Jackson in 2016 to 159 SO (9.10 SO/9 IP) with the Bulls…according to FanGraphs, generated swings-and-misses on 14.0 pct. of his pitches, 2nd-highest in the International League behind teammate Brent Honeywell (14.3)... Led the IL in strikeouts, the second consecutive year and fifth time in seven seasons a Bulls pitcher was the league leader…tied for the IL lead in starts, ranked 2nd in wins, 3rd in innings, 4th in S0/9 IP, 5th in BB/9 IP and 8th in ERA... Limited left-handed hitters to a .217/.278/.343 (43-for-198) line with 3 HR…righties hit .256 (101-for-394) against him with 17 HR... Won both of his IL postseason starts…was the Game 1 starter in the IL Semifinals vs. Indianapolis (Pirates) and the Governors' Cup vs. Scranton/Wilkes-Barres (Yankees)…was 2-0 with a 1.38 ERA (13-IP, 2-ER)... Started the Triple-A National Championship Game against Memphis (Cardinals)…yielded 2 runs in 1.1 IP but got no-decision as the Bulls came back to win, 5-3... Twice was named IL Pitcher of the Week… received the honor for the periods of June 19-25 and July 31-Aug 6... Named to the Rays Organizational All-Star Team by MLB.com... Ranked by Baseball America as the No. 26 prospect in the Rays system following the season. Named the Southern League's Most Outstanding Pitcher after spending the entire sea-son with Double-A Jackson…his 2.95 ERA ranked 2nd to Chih-Wei Hu (2.59) and his 12 wins tied for the league lead with two others including Taylor Guerrieri…also ranked among league leaders in WHIP (1.11, 2nd), opp avg. (.232, 3rd) and winning pct. (.750, 1st)…named to the SL midseason and postseason All-Star teams…held left-handed hit-ters to a .183 avg. (24-for-131)…had a 7-inning CG SHO on April 30 (G2) vs. Mobile (Diamondbacks)…went 5-0 with a 1.80 ERA (30-IP, 6-ER) in May…was SL Pitcher of the Week for May 23-29 and Aug 1-7…named to the Mariners Organizational All-Star Team by MiLB.com. May 1, 2018 Tampa Bay Rays recalled LHP Ryan Yarbrough from Durham Bulls. April 29, 2018 Tampa Bay Rays optioned LHP Ryan Yarbrough to Durham Bulls. November 20, 2017 Tampa Bay Rays selected the contract of Ryan Yarbrough from Durham Bulls. September 6, 2017 Durham Bulls activated LHP Ryan Yarbrough from the temporarily inactive list. September 1, 2017 Durham Bulls placed LHP Ryan Yarbrough on the temporarily inactive list. July 15, 2017 Durham Bulls activated LHP Ryan Yarbrough from the temporarily inactive list. July 7, 2017 Durham Bulls placed LHP Ryan Yarbrough on the temporarily inactive list. April 4, 2017 LHP Ryan Yarbrough assigned to Durham Bulls from Montgomery Biscuits. January 11, 2017 Tampa Bay Rays traded LHP Drew Smyly to Seattle Mariners for SS Carlos Vargas, CF Mallex Smith and LHP Ryan Yarbrough. January 11, 2017 LHP Ryan Yarbrough assigned to Montgomery Biscuits. September 30, 2016 Arkansas Travelers activated LHP Ryan Yarbrough from the 7-day disabled list. September 4, 2016 Ryan Yarbrough roster status changed by Jackson Generals. September 3, 2016 Jackson Generals activated LHP Ryan Yarbrough from the 7-day disabled list. August 22, 2016 Jackson Generals placed LHP Ryan Yarbrough on the 7-day disabled list retroactive to August 20, 2016. April 4, 2016 LHP Ryan Yarbrough assigned to Jackson Generals from Bakersfield Blaze. March 12, 2016 LHP Ryan Yarbrough assigned to Seattle Mariners. August 12, 2015 LHP Ryan Yarbrough assigned to Bakersfield Blaze from Clinton LumberKings. July 31, 2015 LHP Ryan Yarbrough assigned to Clinton LumberKings from AZL Mariners. July 16, 2015 LHP Ryan Yarbrough assigned to AZL Mariners from Bakersfield Blaze. June 15, 2015 Bakersfield Blaze placed LHP Ryan Yarbrough on the 7-day disabled list. June 12, 2015 LHP Ryan Yarbrough assigned to Bakersfield Blaze from Everett AquaSox. June 4, 2015 LHP Ryan Yarbrough assigned to Everett AquaSox from Bakersfield Blaze. April 7, 2015 LHP Ryan Yarbrough assigned to Bakersfield Blaze from Everett AquaSox. June 29, 2014 LHP Ryan Yarbrough assigned to Everett AquaSox from Pulaski Mariners. June 16, 2014 LHP Ryan Yarbrough assigned to Pulaski Mariners. June 12, 2014 Seattle Mariners signed LHP Ryan Yarbrough.